Zecco is one of the best discount stock broker that lets investors trade stocks and ETFs for less. At $4.95 per trade, you can make real-time online trades with Zecco Trading regardless the number of shares you want to buy or sell. Opening a brokerage account with Zecco is straightforward and the whole process takes less than 30 minutes to complete. Zecco Trading is an online discount broker which offers low commission trades of stocks, ETFs, and options. 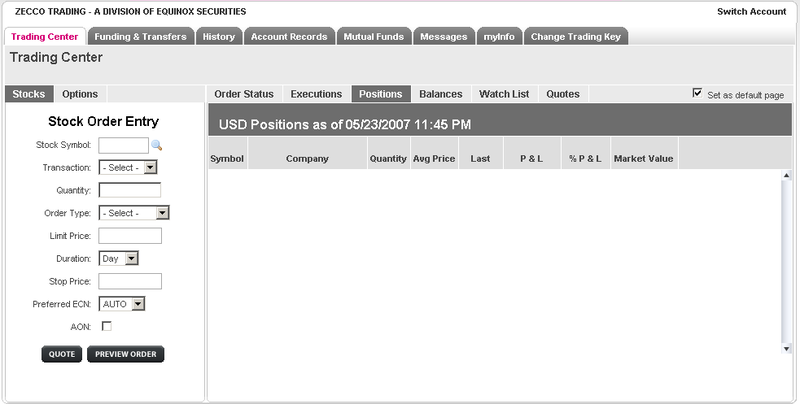 Currently the broker charges $4.95 for each stock trade, plus $0.50 per contract for each options trade. If you want to invest a large amount of money with Zecco, you can get 10 commission-free trades per month when your account balance is at least $25,000. You can also get 10 free trades if you trade more than 25 times per month. Even with a small account, the $4.50 commission is still cheaper than what most online brokers charge for online stock trades (see discount broker comparison for details on stock and options commissions). 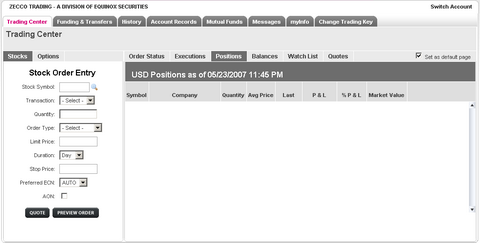 If you are interested in a Zecco Trading brokerage account, you can get on online. In fact, the online application process is quite straightforward and can be done entirely online without involving any paperwork. 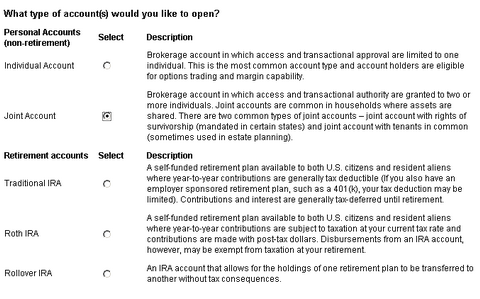 During the application, you will have a chance to select what type of account you want to have, including Individual Account, Joint Account, and IRA Accounts. Once you select an account type, the reset of the application is rather routine. You will be asked for personal information such as name, address, SSN, employment, income, investment purpose, investable assets amount, and bank, etc, which are required when you apply for a bank account or a broker account. At the end of the application, you will be asked to sign your application electronically, which means that once you sign, your application is completed and, therefore, no additional paperwork is needed for you to mail back to Zecco. After the application is completed, you will be informed that the system will generate an account number for you before you can access your newly opened account, and the process could take from a few moments to up to 3 hours. Once your account is available, the first thing you may want to do is setup an external ACH account so that you can transfer money to Zecco and begin to trade. Even though Zecco doesn’t require an initial deposit to open an account, you do have to have money in your account before making a trade. Using ACH fund transfer is the easiest way to fund your account. To initiate the ACH process, you need to type in your account number in the For Account and use the Request Now button to set up external ACH link, which can be either your checking account or savings account. I recommend using a checking account because savings accounts usually have withdrawal limit (6 per month) and if you go over the limit, you are likely to be charged with a fee. After an external ACH bank link is established, you will be able to verify your ownership of the external bank account by confirming two small deposits that are deposited into your bank account. Once the account is verified, you can proceed with fund transfer, which will be done next day. A couple of days later, your fund will be available in Zecco and you can begin trading stocks or ETFs or options through Zecco online trading platform. That’s it. Quite simple, isn’t it?